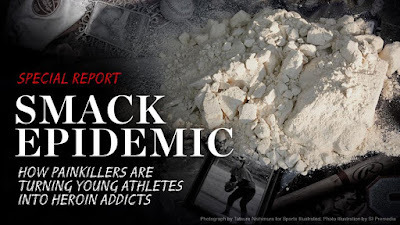 A few weeks ago Sports Illustrated had a compelling piece on prescription drug abuse and the jump to heroin addiction. Roman Montano had barely learned cursive when he was asked to sign his first baseball. Parents of teammates had watched him dominate game after game in Albuquerque’s Little League during the summer of 2000, mowing down batters and belting home runs. The autograph requests were mostly facetious, but what they signified was clear: The kid was going somewhere. The next few years only confirmed that notion. Roman grew to 6’6″ and 250 pounds. He made a mockery of the weight room at Eldorado High and ran the 40-yard dash in 4.9. As a sophomore defensive lineman he was honorable mention all-state in Class 5A. He also joined the basketball team his senior year, giving in to the pleadings of the coach, and was instantly the Eagles’ best player. And after high school, when he trained with the legion of MMA fighters based in Albuquerque, they encouraged him to compete as a heavyweight. For the complete article on Sports Illustrated site please go here. Shocking News– Advertising influences youth on marijuana!